In 2015, as a graduate student at the Design Academy Eindhoven in the Netherlands, Eleonore Delisse decided to redesign the SAD lamp used by those with Seasonal Affective Disorder. While light therapy is an important treatment for Seasonal Affective Disorder, SAD lamps are designed to get your body the light it needs with little regard to aesthetics. Enter the Day&Night light, Delisse’s lamps designed to regulate biological clocks. The lamps—finally available through Kickstarter from Delisse and her design partner Laura Ferriere—are sold as a pair, so that you can use one during the day and one at night. 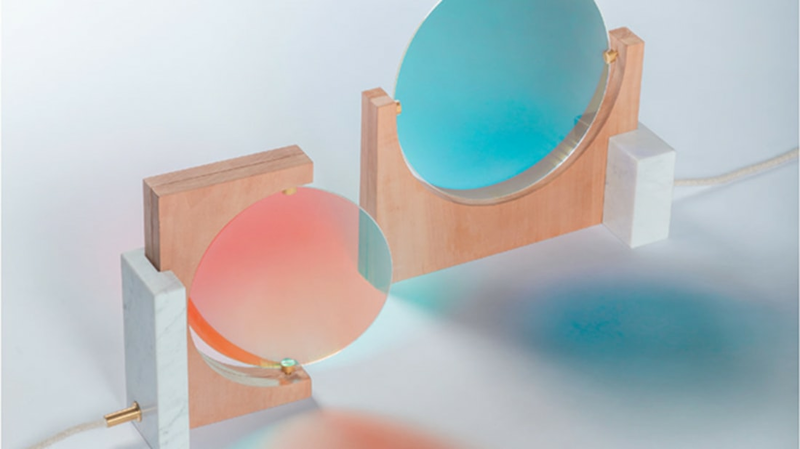 Each of these lamps consists of a circular plate of colored glass and a wooden body—blue for during the day, red for night. They don’t have an on switch; when you plug them in the first time, they run for six hours before turning off. After that first day, they’ll turn back on at the same time that you plugged them in originally. The designers recommend plugging the “Day” light in at 6 a.m., and plugging the “Night” light in at 6 p.m. Colored light affects the sleep hormone melatonin. Blue light suppresses the hormone’s secretion, keeping you awake, while red light can help you sleep. So while the Day&Night lamps were originally designed to reset the biological clock to treat SAD, they can also just be used to get a better night’s rest. If staring into a bright light can boost your mood, staring at a beautiful bright light might be even better. If you can’t afford the $700-plus lamps, there’s also a miniature version that reflects light from a tea candle. It may not have clinical benefits, but it’s certainly cute.